Spending time with your child on the playground is truly one of life’s simple pleasures. You know these precious years are fleeting, so you want to enjoy them while they last, right? Exploring the playground alongside your child is a great way to enjoy this time together, but there is one instance when you should step back and let your little ones explore alone. Some parents have found out the hard way that going down the slide with their kids can result in sprains, fractures, or worse. Heather Clare’s story (from US Weekly magazine) is just one example. In 2015, she went down a slide with her 12-month-old daughter. The photo (linked in the article above) shows the exact moment when something horrific happened. Parents like Heather think they’re keeping their child stay safe by going down the slide with them, but the risk of serious injury is significant. A heavy adult behind a small child means a leg turned in the wrong direction can quickly bend too far. That’s what Heather’s daughter (Meadow) experienced when her leg broke while the mother and daughter rode down the slide together. According to the US Weekly Article written by Rachel P. Abrahamson, Heather shared the photo hoping to spare other parents and children from the same pain her daughter felt and the guilt that she feels over the incident. Abrahamson goes on to mention that the emergency room doctor advised there is no safe way to go down a slide with your child, and that the weight of a person behind the child doesn’t allow them to stop if a limb gets caught. How does it happen? Shoes with rubber soles create traction. When a child goes down a slide wearing rubber-soled shoes, the shoes can stick to the surface of the slide. Legs can bend and torsos can twist. Normally, the child pulls his or her leg back in the correct direction and continues down the slide. But when you add the weight of a full-grown parent behind the child, there isn’t time to stop and straighten out the legs. They keep getting pushed forward. According to an abstract from the U.S. Library of Medicine National Institutes of Health, the injury is often a tibia spiral fracture (break of the shin bone). Every year, orthopedic specialists see toddlers and young children with these injuries. An estimated 352,698 children under the age of 6 were injured riding a slide while on a parent’s lap in the United States between 2002 and 2015. 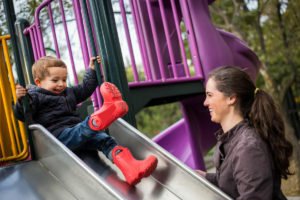 One study tracked kids at Winthrop Hospital in Mineola, New York and found that nearly 14 percent of pediatric leg fractures over an 11-month period involved toddlers riding down the slide with a parent. The study also showed that every single slide injury for kids under 3 happened while riding on a parent’s lap. If you have a very small child and don’t feel comfortable letting them ride alone, place them on the slide at the halfway point while you stand next to the slide. Hold their hand as they go down. Take off their shoes if they’re wearing rubber-soled sneakers, and make sure your child’s legs don’t touch the sides or sliding surface. While you’re on the playground, watching your little one go down the slide, there are a couple of additional things to be mindful of. Hot slide surfaces can be very consequential. Direct sunlight can heat plastic and metal slides enough to cause serious injuries. Surprisingly, it doesn’t even have to be all that hot outside. Be sure your kids are wearing long pants if the play equipment feels hot to the touch, and always be sure to touch the surface of the slide on a sunny day before letting your child climb on. The other common slide safety issue is insufficient safety surfacing. Falls around slides are inevitable, so the area around a slide needs to provide some protection. Asphalt and concrete don’t offer any shock-absorbing protection, but grass and dirt aren’t much better. Safety-tested poured-in-place rubber surfacing or rubber mulch from No Fault Sport Group can help prevent injuries. 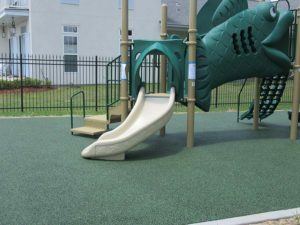 This surfacing should extend at least 6 feet around play equipment and be professionally installed. 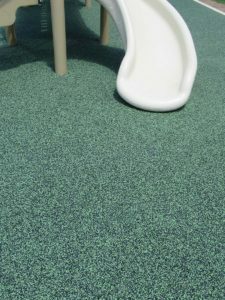 Give us a call at 1–866–NFSPORT (637-7678) if you need to protect the hard surfaces in your play area; our experts will be happy to answer your questions and “slide into” the right safety surfacing products to fit your needs.